Apple dropped a bombshell in January by suing Qualcomm, one of its biggest hardware partners, for $1 billion (around £800 million/AU$1.3 billion). Qualcomm is the chipmaker responsible for the vast majority of mobile processors, such as the Snapdragon silicon found in most Android phones, as well as chips that connect to cellular networks, used in Apple’s iPhones. Fast forward a few months and Qualcomm fired back at Apple with a 134-page countersuit of its own. Allegedly the tech giant crippled the performance of Qualcomm's cellular chips in order to protect Apple’s other cellular chip supplier, Intel. If you’re confused by all the back and forth, let’s break down why Apple and Qualcomm are suing each other in the first place and what this could mean for the future of the iPhone. Why is Apple suing one of its biggest chip suppliers? For many years, the two companies appeared to be getting on swimmingly. Apple used Qualcomm components in its devices and licensed the patents required to build a modern smartphone, while Qualcomm licensed selected patents from Apple in return. 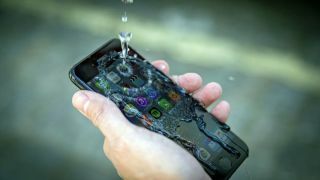 In January this year, however, the façade crumbled: the US Federal Trade Commission (FTC) filed suit against Qualcomm based largely on a complaint made by Apple, accusing the company of forcing it into using Qualcomm components exclusively, with onerous and anti-competitive patent royalty contract terms. The FTC's filing, which was approved by a two-to-one vote of the Commission, accused Qualcomm of enforcing a "no licence, no chips" policy in which baseband processors – the components responsible for running the modem and providing cellular network connectivity for both data and voice – were provided to companies only if they met Qualcomm's preferred licence terms, which included increased royalty fees should any customer have the temerity to launch devices featuring competitors’ baseband chips. In the days that followed the FTC's filing, Apple filed its own lawsuit [PDF] against Qualcomm, objecting to the latter’s patent fees. Qualcomm charges Apple licensing fees which are calculated as a percentage of the total cost of iPhones, according to Fortune, which amounts to about $15 per phone. Apple claims this is monopolistic as well as unfair to other chipmakers, as Qualcomm’s licensing costs piggyback off the cost of the iPhone as a whole. Furthermore, Qualcomm levies a licensing fee on Apple regardless if its chips are used in a phone. This means Apple pays Qualcomm once to license its patents and pays again to purchase Qualcomm’s silicon. For comparison, most component suppliers bundle their intellectual property license fee with the sale of their chips. Apple isn’t the only one upset with Qualcomm. The San Diego-based company has come under fire in recent years for monopolistic practices. Just two years ago, Qualcomm paid $975 million to China for anti-competitive practices. In December 2016, Qualcomm was hit with a $873 million fine in South Korea for the same thing. Then in January this year, Qualcomm was charged with anti-competitive practices in the US by the Federal Trade Commission. Why is Qualcomm suing Apple? Qualcomm, naturally, has denied any wrongdoing. "Apple has intentionally mischaracterized our agreements and negotiations," claimed Qualcomm general counsel Dan Rosenberg at the time, "as well as the enormity and value of the technology we have invented, contributed and shared with all mobile device makers through our licensing program." In its countersuit [PDF download], Qualcomm claims Apple deliberately slowed down its 4G LTE chips in the iPhone 7 to hide that Intel’s 4G LTE chips, which Apple also uses, performed far worse. The lawsuit also claims Apple encouraged “regulatory attacks” on Qualcomm’s business in different countries by “misrepresenting facts and making false statements.” Qualcomm didn’t specify a dollar amount in damages it’s seeking from Apple. “Over the last 10 years, Apple has played a significant role in bringing the benefits of mobile technology to consumers with its popular products and services,” Qualcomm executive vice president and general counsel Don Rosenberg said in a statement. Certainly the most damning part of Qualcomm’s suit is its claims the iPhone maker deliberately slowed down Qualcomm chips to hide supposed inferior performance of chips made by Intel, which Apple also uses in the iPhone 7 and iPhone 7 Plus. This allegation is supported by data unearthed by researchers at Twin Prime Inc., a mobile app optimization company, and Cellular Insights, an independent organization that tests radio performance of consumer devices. Although no official reason was provided, the researchers speculated that Apple throttled CDMA Qualcomm chips found in Verizon and Sprint phones to match the slower performing Intel chips found in GSM iPhones (AT&T and T-Mobile) to create the illusion of equality among its phones. This way, every iPhone 7 would perform the same across networks, even though iPhones sporting Qualcomm’s 4G LTE chips could perform better. For reference, Qualcomm’s X12 modem in the iPhone 7 is capable of downloading data at 600 Mbps, compared to the 450 Mbps of Intel’s modems. Regardless of the reason, Qualcomm also alleges that Apple "threatened Qualcomm in an attempt to prevent it from making any public comparisons about the superior performance of the Qualcomm-powered iPhones." This isn’t the first time Apple has used chips with differing performance. When the iPhone 6S came out in 2015, reviewers initially noticed some battery life differences between the iPhone 6S phones with TSMC-made chips and those with chips from Samsung. However, a later Consumer Reports test showed negligible performance differences between the chips. We’ve asked Apple and Qualcomm for comment on the lawsuits, and we’ll update this story if we hear back. What does all this mean for the iPhone? Although we may not see the outcome of the Apple vs Qualcomm battle for some time, we can speculate what all this might mean for Apple and its iconic smartphone from here on out. If Apple is successful in suing Qualcomm for monopolistic practices, we could potentially see cheaper iPhones since Apple doesn’t have to pay Qualcomm as much per device. However, Apple also has to answer if it deliberately slowed down 4G performance in its Qualcomm-equipped iPhones in order to create performance parity across handsets. If this is true and in breach of contract with Qualcomm, Apple may have to pay a hefty fine. That situation has been further inflamed by the fact Qualcomm is now looking to put a ban on incoming iPhones, putting the stoppers on the impending iPhone 8 unveiling. That's fairly theoretical, as it's very unlikely to go through given the extreme legal machinations each mega-rich company can put the other through, but it's another bargaining chip ahead of the inevitable resolution. And when the dust has settled it could be business as usual. "Without the launchpad, in this case Qualcomm's fundamental technologies, would Apple be where they are today?" Sue Edwards, managing director of business and law consultancy Law Hound asks. "Manufacturers like Apple will continue to want and rely on fundamental technologies from leaders like Qualcomm for them to do what they do best: create the brand and desire in the market. It's a symbiotic relationship." But it's just as likely that Apple and Qualcomm’s relationship won’t be the same moving forward. Apple may look for other chipmakers that can provide better value to help the company lower the price of its iPhones amidst tough competition from cheaper Android phones. Apple is already using Intel, but may seek out other chipmakers to prevent an over reliance on one manufacturer. With the iPhone 8 release around the corner, Apple may ditch Qualcomm’s LTE chips altogether for Intel’s new XMM 7650 chips, according to an AppleInsider report. The Intel chip is capable of up to 1 Gbps download speeds and up to 225 Mbps uploads, marking a 45% performance increase from the modems in the iPhone 7. The iPhone’s silicon future, it seems, is already starting to change.